Dating Dynamics was founded by Carlos Xuma in 2002. He is a dating and attraction advisor, as well as a motivational and life counselor. Carlos' mission for the company is to bring men and women together through awareness of both their traditional and contemporary gender roles. 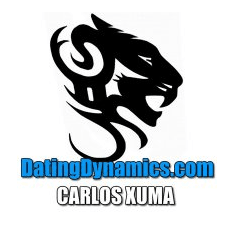 Carlos Xuma's DatingDynamics.com focuses on ramping up men's social skills with women, teaching confidence and alpha dating power to eliminate self-doubt. Much of the methodology taught by Carlos places much emphasis on becoming more of an "Alpha man" in approaching women, interacting with them, and eventually attracting them. But the training does not end there. Carlos's Dating Dynamics also has products geared towards relationship enhancement and what to do next once you overcome your inner fears and are able to land the girl of your dreams. Dating Dynamics and its range of products are a result of Carlos Xuma's own experiences through years of dating successes and failures. Some of the more popular programs include The Dating Black Book, the Alpha Immersion DVD program, and the Advanced Audio Coaching series. Carlos also produces a regular newsletter as well as a podcast available weekly on iTunes. In addition, Carlos also regularly conducts workshops, in-field training sessions, phone counseling, and group seminars. Help us improve this profile of Dating Dynamics by sending us any information you believe to be missing, wrong or lacking detail. Please state sources where possible to make our job easier to verify the correctness of the information.